A wreath will be laid and a minutes silence held in tribute to Richard Laco who was killed on this building site last week. This is an opportunity for friends and workers on the site to show a moments respect for this tragic death. We appeal to all workers leave your place of work and come to the site entrance at 2pm to join the tribute to their co-worker. Too many building workers die on construction sites. We need to make sure no other families have to suffer the heartache of losing a loved one. 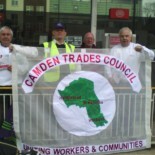 This entry was posted on November 12, 2013 by CAMDEN TRADES COUNCIL.